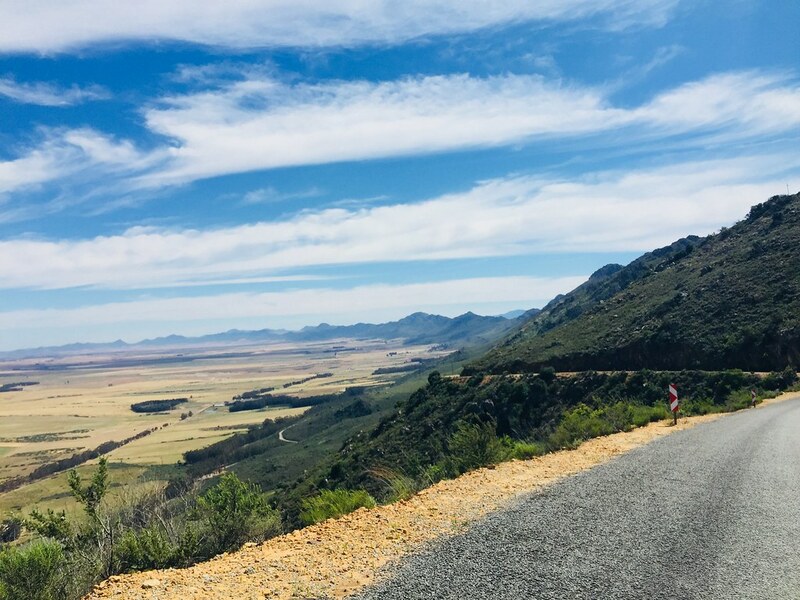 Nestled in the Winterhoek mountains near Porterville this guest farm has stunning sweeping scenery in a wonderfully secluded valley. 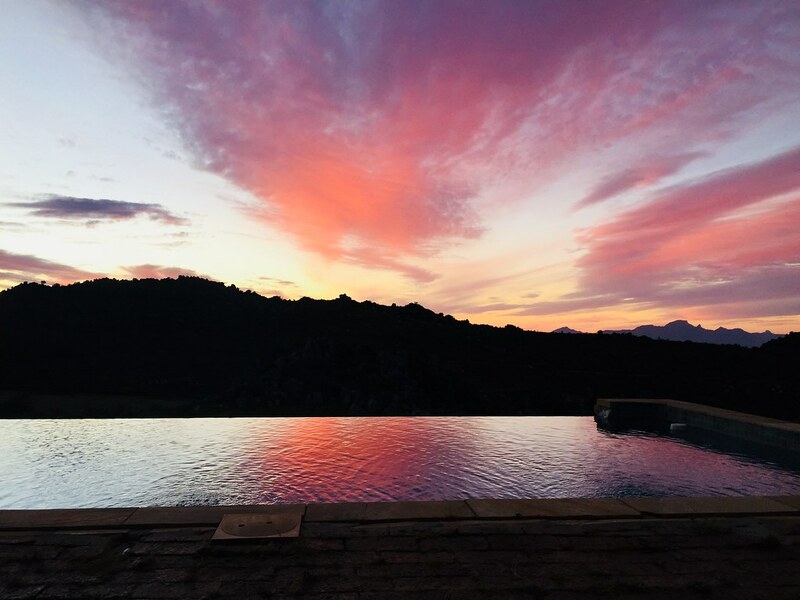 If you are looking for a place to completely unwind, breathe fresh mountain air, watch the sun setting over the Protea covered veld, walk amongst indigenous fauna and flora and just re-connect with friends and family – then this is the perfect place for you. Pampoenfontein has five well-equipped fully self-catering cottages, each with its own unique charm. We stayed in Restio, a modern stone cottage with a stunning pool on the veranda and an unbelievable view of the mountains. 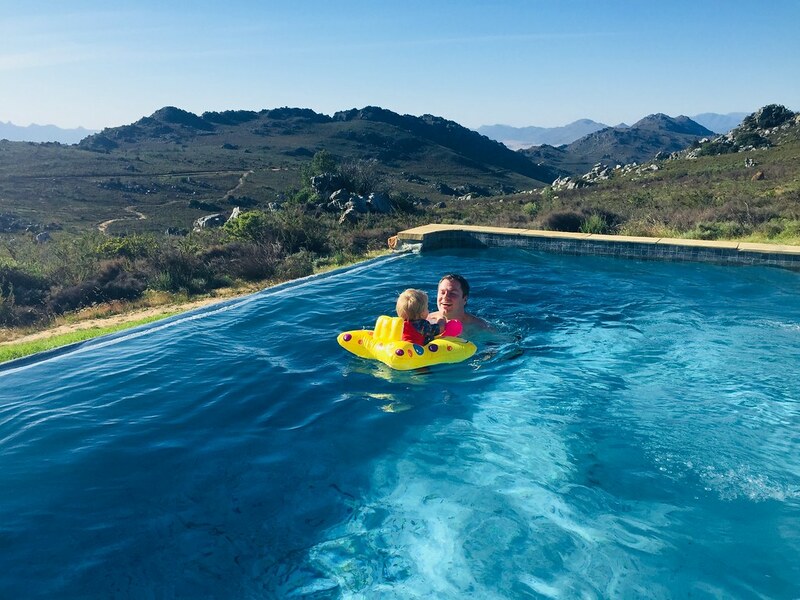 We enjoyed braai’s on the veranda, walks in the surrounding veld with our children discovering insects and flowers, and cooled off in the pool. Lilly cottage overlooks the most beautiful lilly pond, which was covered in waterblommetjies at the time of our stay. It is an endearing little cottage, perfect for a small family or for a romantic weekend away with your other half. Pelargonium is ideal for a family with its oldy worldy charm and sweeping views over the valley and mountains. Heron house used to be the owner’s private residence – it has a private pool and is located a stone’s throw away from the dam. It is comfortably furnished and sleeps eight in four twin bedrooms. Protea is a rustic, yet charming cottage that can sleep seven people in two bedrooms with a sofa bed in the lounge. The cottages are spread out across the valley, creating a sense of privacy and connection with the immediate surrounds. The only word to describe the drive up the mountain pass is EPIC. It snakes ever upwards with the mountain on one side and a sheer drop on the other. The higher you go the more incredible the view becomes. Once you reach the top you feel like you’ve entered the proverbial Narnian ‘wardrobe’ into a never-ending mountainous world. If you bring all the required food and drink with you there would be absolutely no need to leave Pampoenfontein for the duration of your stay. However, if you feel the need to explore, then I would recommend visiting the Indie Ale Craft Brewery just outside Porterville. The beer is great, there is a little play area for children on the lawn and their pizzas (the only thing they serve) are genuinely the best I have had in this country – perfection. 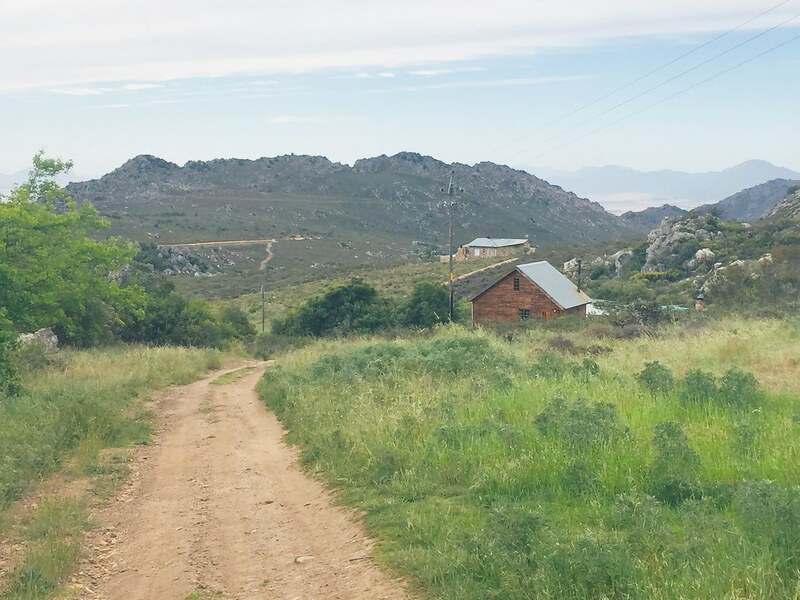 Pampoenfontein offers several paths across the farm for walking and exploring. The fauna is diverse and animals include Klipspringer, Wild Cat, Grysbok, Caracal, Cape Fox, Leopard amongst others. 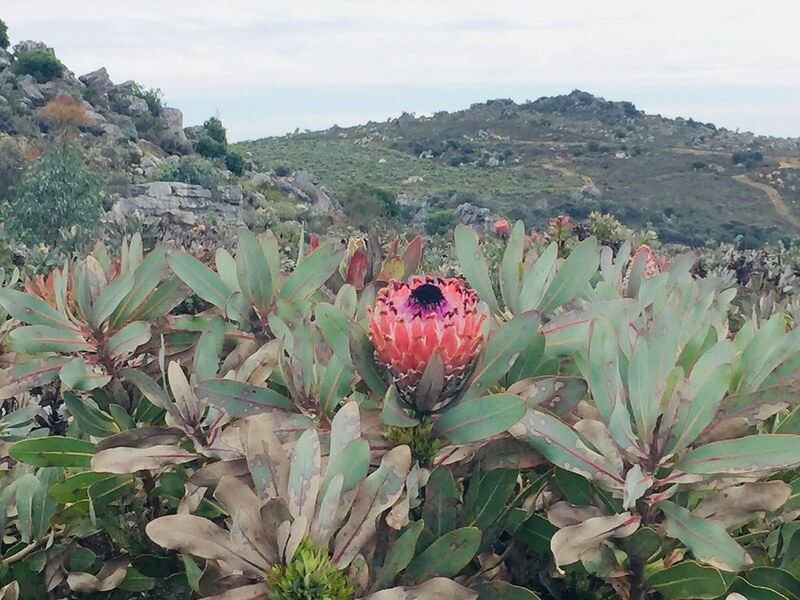 Between June and February you will be sure to see flowers – from June to December it’s Proteas and Pincushions and from November to February the Ericas are in bloom. 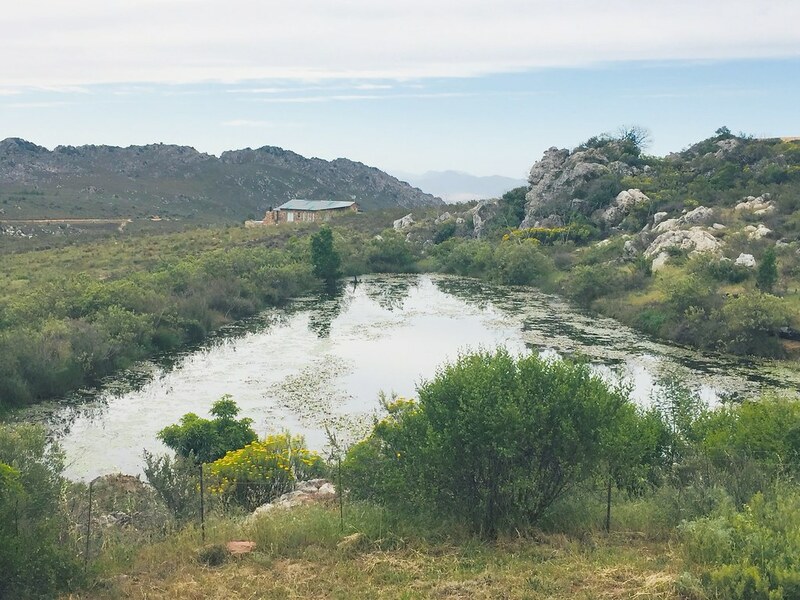 Let these pictures speak for themselves in persuading you to book your place at Pampoenfontein. We have fallen in love with this place and no doubt you and your family will too.